I think it’s pretty much taken as read that if you want to be a successful fiction writer, you need to have a vivid, fertile imagination. You can take inspiration from real-life events, or people, but when it comes to joining the dots – you make it up. The idea for The Theatre of Dreams was born during a walk on a blustery seafront and the discovery of a lost local landmark. 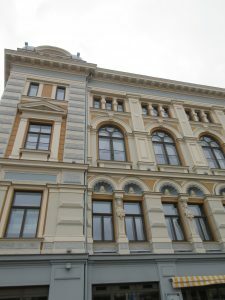 Yes, the theatre in my novel was inspired by a real building, but the story itself is purely a figment of my imagination. Sometimes it doesn’t take much to trigger a burst of creativity. 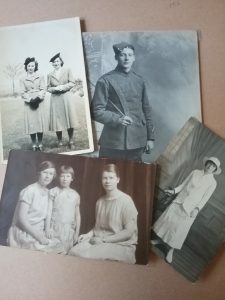 Last autumn my youngest daughter broke her foot and was incapacitated for a few weeks, so to fend off the boredom we undertook an exercise in triple-generation bonding – sorting out my mum’s photograph collection. My parents took many cruises – but my dad, especially in his later years, didn’t like getting off the ship although he did like taking photographs. Therefore my mum has been left with several albums full of pictures of docksides. Great if you like a container port, but she and I were both of the opinion that if you’ve seen one container port you’ve seen them all. The albums were sorted – twenty years of cruise holidays condensed into one ‘highlights’ album and not an industrial crane in sight. But, whilst going through Mum’s photograph collection, I discovered a selection she had inherited from her own parents stuffed into one of those sticky plastic albums that were very popular back in the 1980s. 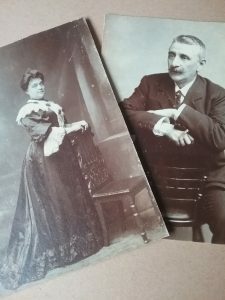 A couple of weeks ago I finally got round to retrieving the inherited photos from their sticky plastic grave with the intention of re-posting them into a scrapbook. My mum is 92 years old and prone to bouts of forgetfulness but she had no problem recalling the names of long-lost relatives she hadn’t seen since the 1950s. Some of these pictures went further back – to the 1920s and beyond, the era of the austere Edwardian matriarch resplendent in her full-length frock. Wonderful names rolled off my mum’s tongue as she called relatives from her own childhood – who knew I had a great aunts Tizzy and Ahinoam -understandably always known as Inny. There were pictures of my grandparents as young people– my grandfather added a year onto his age so that he could join up to fight in the First World War and only remembered to take it off again in the 1930s. He looked dashingly handsome in his uniform. How did he meet my grandmother? It began with a book. Grandma (Mary) had been fond of another young man of German extraction who had been waltzed off from his Lancashire village into a camp during the First World War never to be seen again. Apparently Mary had lent him a book and he made his friend Bert promise to return the book to Mary, and so Mary and Bert’s romance began, but meanwhile Bert’s step-mother was also trying to hook Bert up with her own daughter – an actress. If these pictures could talk they might tell a different story – events might not have happened quite like that, or necessarily in that order, but it doesn’t take much to ignite a spark. These sepia people might well have kept my mum occupied for a happy afternoon of reminiscing, but they could provide me with a whole plethora of novel ideas. Here are my great-grandparents who met and married in Brazil having both gone out there to work in a cotton mill in the 1870s. How brave were they? And we think our youngsters are pretty adventurous when they set off overseas with their i-phone, travel apps, and return air tickets. It’s time for some more comfort reading – and today’s special guest is Scottish writer Val Penny. 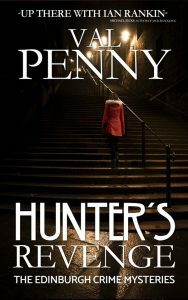 Val has recently launched the second book in her Edinburgh Crime Mysteries series, Hunter’s Revenge. Over to you Val. 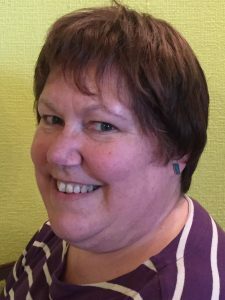 I am delighted to be visiting the blog run by my friend and fellow author, Rosie Travers today. She has set me a very difficult task, to choose only five books that I would consider my comfort reads. Only five! I have always enjoyed hearing stories and reading books. I find it a great way to escape from reality. However, as I am lucky enough to have a good memory, I rarely read a book more than once, but there are a few old favourites which break that rule and to which I return time and again. 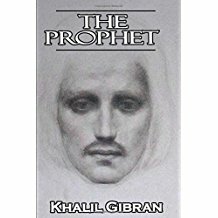 The first of these is a classic: ‘The Prophet’ by the Lebanese author and poet Kahlil Gibran. The wisdom and melody of this little book never fails to bring me peace when I am in low spirits and comfort in times of distress. If I could save only one book in my house, this would be it. 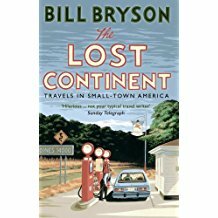 Next, and very close to the top of the list is a very different piece of writing: ‘The Lost Continent’ by the American author Bill Bryson. Bryson lived and taught in the UK for many years, but hails from Des Moines Iowa. After his father’s death, he decided to take a road trip through the USA. This would allow him to visit the places he remembered visiting with his parents. All was not as he remembered it. He remembered the America into which I was born in the 1950s and 60s. Things have moved on and he describes things that were and those that now are with a wit and lightness of touch that no matter how often I read this book, it makes me laugh out loud. Third on my list must come a book of poetry that I discovered quite by accident. 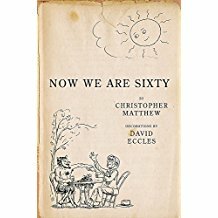 I gave it to my mother-in-law for her sixtieth birthday, simply because of the title ‘Now We Are Sixty’. It is a compilation of poems by the English poet Christopher Matthews and illustrated by David Eccles. The poems are after those by A.A.Milne in his children’s book of poetry, ‘Now We Are Six’ but with a twist to reflect the thoughts and issues faced by older readers. I have been enjoying these poems since my early thirties, but even now, as I get ever closer to being part of the target audience, the book and its illustrations make me smile. As my list gets closer to its end, the choices, inevitably get harder, and my fourth choice is not an obvious one. The reason I feel obliged to include it is because it was the first adult book that my daughters recommended to me. 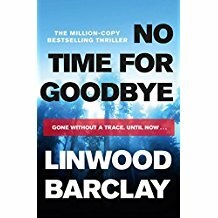 It is ‘No Time for Goodbye’ the best-selling novel by Canadian author Linwood Barclay. I enjoy this book very much and return to it for inspiration now, because it is the first thriller I ever read where I was aware of humour in the writing. It is also a very clever story. Although my fondest memory of this novel is no doubt caused by the literary ‘coming of age’ of my daughters, since reading ‘No Time for Goodbye’ for the first time, I have met Linwood on a couple of occasions. He, like his novels, is intelligent, interesting and amusing. I have enjoyed all his books that I have read, but this one is my favourite. Last on my list, is another book by an American author, Mitch Albom. 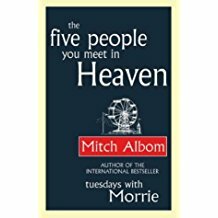 I have read several books by Mitch Albom and his best known is probably the non-fiction work, ‘Tuesdays with Morrie’, which is fascinating. However, my favourite work by this author is a fictional piece, ‘The Five People you meet in Heaven’. It re-affirms my belief that all of us have a part to play in this crazy world, it just may not be obvious what that part is to be. I always read this book within a day and I always end up in floods of tears, but feeling peaceful. I find it an inspirational work because it promotes so much thought. So I reach the end of my choices. Thank you for inviting me to your blog today, Rosie and for giving me a chance to share a variety of much loved books with your readers. Thanks Val – some very interesting choices. I was expecting a menagerie of murder, mystery and mayhem! I’ve learned over the last few months that writing a book is the easy bit. Launching, marketing, that’s the hard, stressful stuff and I’ll admit I am feeling slightly out of my depth. 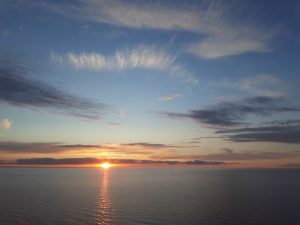 When I first started ‘writing’, I wrote travel blogs. So in an attempt to get my mojo back, here’s a little piece about our recent Baltic cruise. Although travel is my thing, cruising isn’t. I like to think I’m a feisty, independent explorer, but sometimes a bargain is too good to miss and cruising is a good way to see a lot of places in a short space of time. 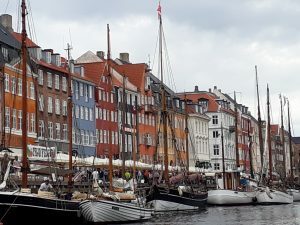 Our first port of call was Copenhagen, a beautiful city we’d always intended to visit while we were living nearby in the Netherlands but never quite got round to. After Denmark, it was onwards to Finland – fulfilling a childhood dream to see the home of the Moomins. I learned to read on the Tove Jansson books so discovering the existence of Moomin Cafés was a bit of a personal treat. 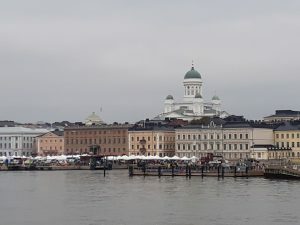 It was very bleak in Helsinki the day we visited and very easy to see why Moomintroll and his family hibernated every winter. After Helsinki the weather picked up again and we travelled on to the highlight of the cruise – St Petersburg. St Petersburg in Russia has long been on my list of must-see destinations. 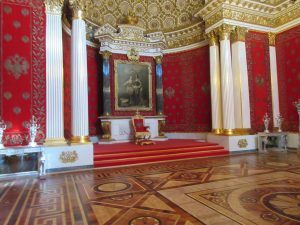 Home of the Russian royals, my imagination was captured as a teenager by the story of the Romanovs and their tragic demise. 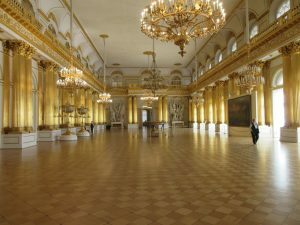 And now that I’ve visited just one of their many palaces, it’s really not that hard to see why the last Tzar and his family lost their lives. 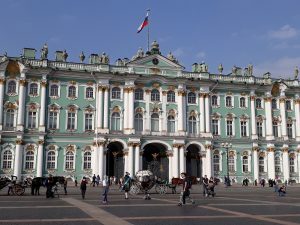 I’ve read a little bit about the Russian revolution, but nothing prepared me for the complete OTT opulence of The Winter Palace in St Petersburg. If you like your gold bling, and over 22 km of corridors to keep all your knick-knacks in, then this is the palace for you. No wonder the starving peasants were a bit upset by the extravagance. The Russian Tzars like to collect things, from ancient Egyptian artefacts to Rembrandt paintings. 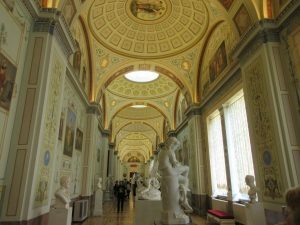 It’s all a bit much to take in, to be honest, and someone has now worked out that if you spent just sixty seconds looking at every exhibit in the Hermitage museum, you’d need eight years to complete your tour. We had just over two hours on our whistle stop expedition and it was exhausting. From Russia to Estonia and Tallin – a charming medieval town of cobbled streets, castles and gabled houses. And after Tallin, Riga in Latvia, an unexpected gem. 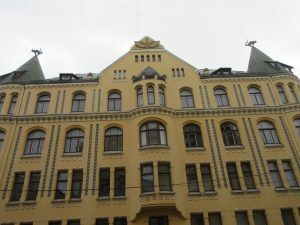 Riga was a revelation with its art nouveau architecture and massive indoor food market housed in former Zeppelin sheds. After Riga it was onwards to Kiel in Germany, a stopping off point for shore excursions to Hamburg. Kiel itself was wet and uninspiring and as we didn’t want to go to Hamburg we took a local bus to view the workings of the Kiel canal – the world’s first man-made waterway which connects to the Baltic to the North Sea. If you’re into industrial-sized lock gates you’d be in industrial-sized-lock gate heaven in Kiel. If you’re not, enough said. Our final stop was tiny port of Skagen at the very northern tip of Denmark. It’s the Danish equivalent of John O’Groats and the country’s top tourist attraction. 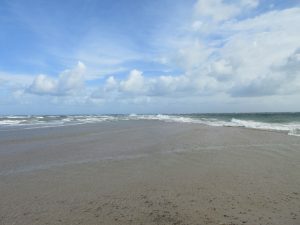 Here you can stand with one foot in the chilly North sea and the other in the equally freezing waters of the Baltic; the tides collide with some ferocity and its quite spectacular to see. Skagen was an attractive little town with arty boutiques and shops selling puffer-jacket style onesies. Like the Moomins, the population of Skagen hibernate in winter – or at least move south. And so the cruise came to an end and we returned to Southampton – and the scales. There’s nothing like a cruise to provide inspiration for a huge menagerie of new characters, or to make you appreciate your relative youth, and your good health. Just because the food is available 24/7 you don’t have to eat it – but plenty of people do. The diet begins tomorrow.